Gary gave us an interesting summary of his career which was all decided by the flip of a coin. 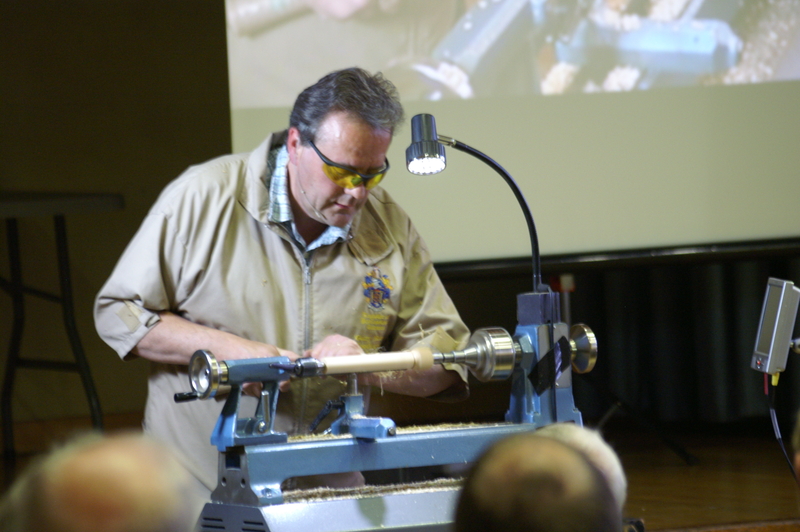 Gary highlighted the pitfalls of woodturning having had issues with astema and loss of smell. He gave us a quick run through of safety procedures, ensuring clothing, eye protection and breathing were covered. The description of how to approach the lathe and use the entire body to make the cuts was very informative. 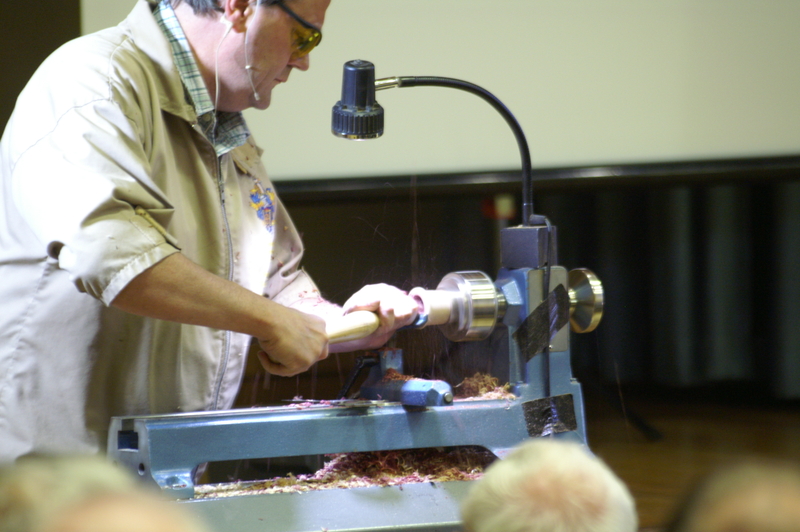 Gary demonstrated the basics of turning going through tools like the skew chisel, roughing gauge. Another good tip was to “float” the bevel and not “rub” the bevel, a common mistake is people pushing to hard. Along with that great tip closely followed by telling that the tool should move at the turners pace and not the pace the tool wants to run at – ie: out of control pace! We were given the pleasure of a funny story where Gary was younger and made one of his first mistakes with a skew chisel. An unfortunate accident where the skew chisel caught in the wood and bounced out of his hands and hit him between the eyes – all could have been avoided if he was holding the tool from the top instead of underneath. We were shown the basics of spindle turning the V cut, beads, coves, etc. 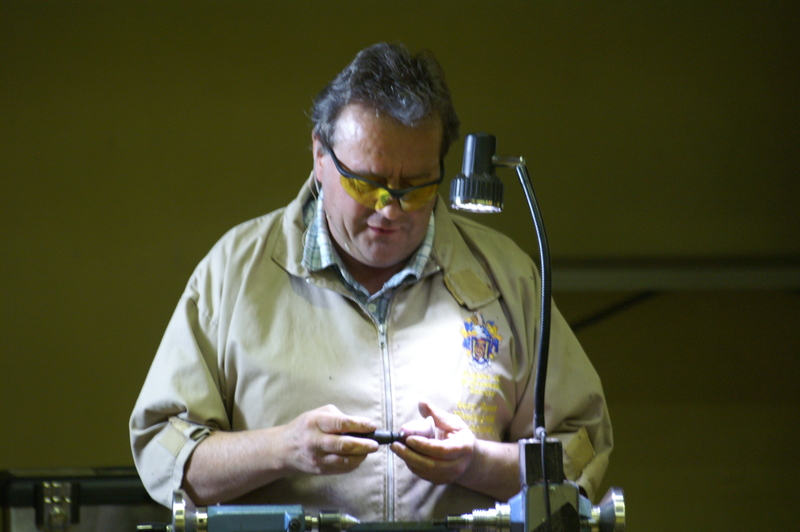 Once we were shown the spindle basic, Gary moved onto the project for the evening – a salt bell. 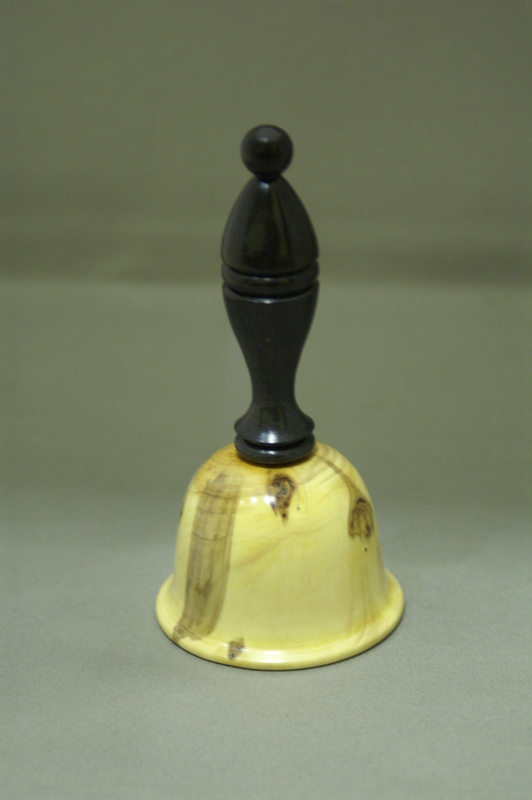 This salt bell is one of many project he sells the designs for as well as a DVD cover the basics of woodturning, tool sharpening and some projects to practice your skills on. A slight crack/split/chip in the Juniper bell/funnel and a flying piece making a jump for freedom caused a “treasure hunt” for the missing piece. Once the Juniper bell had been finished, Gary moved onto the handle, which for this demonstration was ebony. Once the basic shape was turned Gary showed us the threading tools and the techniques involved in using them. This created a threaded handle to screw into the juniper bell. Once the handle was sanded and sand sealer/friction polish applied and parted off, it was screwed into the juniper bell – one salt shaker bell. Gary finished off showing us his way of sharpening his tools.